Surrounded by mentored children, Gov. Phil Scott smiles Wednesday after signing a proclamation recognizing January as National Mentoring Month at a Mentor Vermont celebration in Montpelier. Why I Am a Mentor! Why is an easy question to answer, now that I have been doing it for a while. My mentee comes from a loving home, but I know from the work I do every day that in general, kids today are more isolated; unlike when I grew up, most of our kids have very few adult role models beyond their caregivers at home; they spend too much time focused one-on-one with a computer screen; they are more inclined to pick up a game controller than a book; often times they don’t know how to play games that don’t depend on a computer. I am sure you are hesitating, thinking, “what do I have to give to a child? I get it – despite having spent many years working with kids, I wasn’t sure at first if and how I would connect with a young child who I didn’t know. But after a couple of weeks, our new friendship was cemented and now we both look forward to our next weekly meeting. Saying so long for the summer last June was difficult, but seeing each other again in September was like reconnecting with an old friend. As for time, well, time is a precious quantity for most of us, but mentoring does not take a lot of time. 50 minutes a week, at the beginning of the day, at the school that I drive by every morning on my way to the office. It’s the highpoint of my week. When you mentor a student, you are giving your time to teach the “soft skills” that children cannot learn from TV or a computer game – conversation, turn-taking, winning and losing at play and being okay with either outcome. When I greet my mentee every week, I always get a smile and the end of the session, another smile and a “see you next week.” Who wouldn’t want to start their day like this? I have come to think of the fifty minutes as a gift I give to myself every week. Follow our Peer Mentors on Instagram! Listen to our Mentor Podcast! Our Peer mentors share why they mentor. Listen below and click HERE to see more of what they have to say. 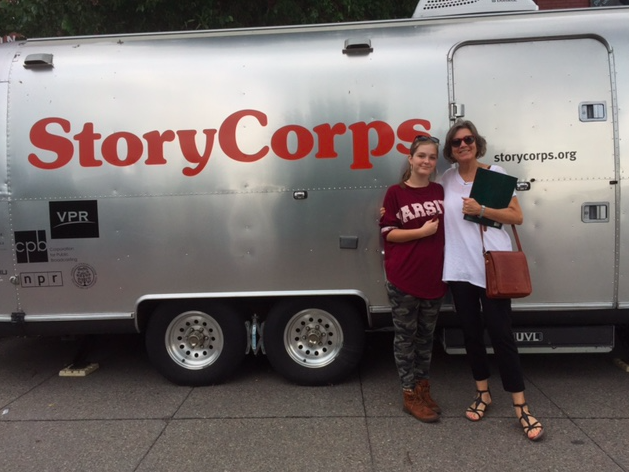 Long-time mentor match Patty and Lydia recorded their story at the StoryCorps booth in Burlington! As January is National Mentoring Month, a time for all of us to reflect on the people who have had an effect on our lives, I thought I would relate my own experience as a mentor and encourage others to share the wisdom and friendship that we, as adults, can offer to young people in our communities. After my first mentee, Dylan, moved with his family to another part of the state, I waited a year before asking to be matched with another young boy. I had grown very fond of Dylan and did not want to just “replace” him as one would a car or a pair of skis. I was also concerned that I might be tempted to compare my new young friend with my first mentee. I mention this because it is a dimension of mentoring that I had not expected, the relationship develops into a friendship which shapes, not only my time, but also my life. Not having children of my own, and having left teaching grade school over 40 years ago, I had not had the opportunity to see how I interact with a young boy on a regular basis. Aspects of myself were revealed to me that otherwise may have lay hidden. Also, having the opportunity to get a glimpse of the world mediated through the eyes and experience of a 10 year old, broadened and deepened my own experience. In that year's hiatus, I realized that I missed that relationship and that dimension of living. Clearly, mentoring is not just about doing something useful and, hopefully helpful for and with a young person, or about providing enriching experiences for someone who may not otherwise have them. Mentoring is the development of a relationship that is mutually beneficial and rewarding, like any good friendship. When Samuel and I first met, I asked him to make a list of things he would like to do. “Look at the stars” was at the top, followed by going to museums – I knew right there that we were well matched. He also had on his list “visit the Humane Society,” so, like me, he also loves animals. “Hiking” was there as well – it doesn't get much better than this. We are going through the list and adding more activities as we get to know one another and find ways to have a good time together. A friend, hearing about his list, offered us her telescope, which we are learning to use. Thanks to Samuel, I have visited the Montshire Museum, a truly wonderful place, where I saw his preferred mode of leaning, kinesthetic. Thanks to him, we built a birdhouse that is far more imaginative than I alone would have conjured up. I call him “eagle eye;” he sees things in the woods that I would pass by without noticing. I have also seen how a young boy, contrary to the stereotype, can be kind and gentle to a degree that is almost breathtaking. I guess I needed the year away from mentoring, but when I pick up Samuel at school on Thursdays and he asks what we are doing today, I am grateful that I did not wait longer. There are many boys and girls waiting for a special friend. Based on my experience, it is likely that many adults do not know that such a friendship is the very thing they need to retrieve a sense of possibility and hope for a better world. You may be one of those adults, visit www.mobiusmentors.org to find a program in your community. Joseph Gainza has been a mentor with Twinfield Together Mentoring Program since 2012. For more information about joining the Twinfield Together Mentoring Program, visit www.twinfieldtogether.net. To learn more about other mentoring programs throughout Vermont, visit www.mobiusmentors.org. ​This fall, education in Vermont has been a hot topic, often leaving many of us wondering what to do right now to help our students, children and neighbors succeed and be happy in school. I believe the answer lies in one word: relationships. As the director of Twinfield Together Mentoring Program, I get to see firsthand how much joy and enthusiasm mentoring relationships bring to the students at Twinfield. Connecting youth to a caring role model can really make a difference in a child’s life. I know this because of the kids who jump for joy when they see that their Everybody Wins! mentor is there to read with them, and because of the parent who tells me that their child’s mentoring days are the best day of the week for that child. This statistic is promising for the 2,300 mentoring pairs currently enrolled through one of more than 140 program sites in Vermont. But what does this mean for all the young Vermonters who are not part of a formal mentoring program? September was Attendance Awareness Month, a national effort to bring awareness of the importance of attendance and its role in academic achievement. This national campaign states the obvious: The more kids are interested and engaged in school, the more likely they are to attend. I know from working at a great school like Twinfield that schools are doing what they can to make school interesting and engaging. As a former educator and mother of three school-aged children, I also know schools cannot do it alone. They need the support and investment of individual community members. I believe connecting our youth with a caring adult, or older student mentor who cares about them and believes in them, is an investment that will last a lifetime. The reason I am speaking out is because I hope in Vermont we can talk about what we can do as individuals to support our youth, our local schools and community. National data from Big Brothers Big Sisters and the National Mentoring Partnership tells us that youth who have a mentor are less likely to skip school and more likely to go on to pursue postsecondary education. Mentoring is a powerful and meaningful way to make a difference, and there are many opportunities to get involved all across the state. If you are interested in finding out how you can support mentoring in your community, visit Mobius, Vermont’s Mentoring Partnership, at mobiusmentors.org. Pam Quinn is program director of Twinfield Together Mentoring Program and a board member of Mobius, Vermont’s Mentoring Partnership. MARSHFIELD — Pam Quinn was near the entryway of Twinfield Union School late Thursday morning when a little boy ran by and yelled, “Mentor!” The child is soon to be partnered with an adult in a mentoring program Quinn oversees at the school. He’s so excited about getting a mentor of his own, she said, he has taken to addressing her by the title of mentor. She sees it as a positive sign of how mentoring is perceived at the school. “We have many children that request mentors. Having a mentor is seen as a privilege, and there is no apparent stigma attached to having a mentor,” said Quinn. A table in the entryway has off-white cloth bags filled with books, like one for Jerrie and Selena. Mentor Jerrie Nash, of Marshfield, is semi- retired, and her mentee is 6-year-old first-grader Selena Lamery. The pair ate lunch together Thursday while reading about Jane Goodall, a scientist who worked with gorillas and taught the world about them. Jolie Zumba, 8, a third-grader, enjoyed making a Mother’s Day card with her mentor, Andrea Carbonneau. “I really like reading and getting to do crafts together,” Jolie said while eating lunch. She said her mentor does not tell her what to do and doesn’t assign homework. They just enjoy time together, and she looks forward to their visits. “She’s really nice,” she said, smiling. 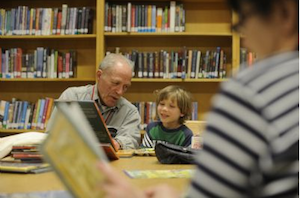 Dave Boyer, of Plainfield, sat in the library with his mentee, 5-year-old, Wesley Barlow, a kindergartner. Wesley was wearing cool 3-D glasses while listening to a story. The school is always looking for new community volunteers, said Quinn, the program’s director. Interested people can contact the school and ask for her. Twinfield Together Mentoring Program began in 2009, said Quinn. “We are funded through grants, school support, individual donors and fundraising efforts,” she said. The school contributes about $5,000 annually, and she applies for grants to fund the program to keep two aspects of the mentoring — one literacy-based and the other community-based — going. 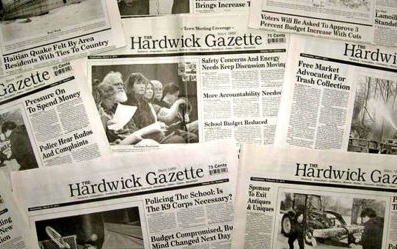 The program expanded in 2012 to include the literacy-based component, called Everybody Wins! Vermont. It brings mentoring partnerships to the youngest children in the school with the hope that a mentoring pair will eventually move to community-based mentoring and continue throughout the child’s education. The school is highly unusual, said Quinn, in hosting a mentoring program and its staff in-house. She is a school employee. The programs support 36 one-on-one mentoring matches, said Quinn, with children as young as kindergarten at school and community partnerships extending all the way through some students’ senior year. “Twinfield Together Mentoring Program believes that every child that wants a mentor should have a mentor,” she said. Levy, who is 74 and retired, said both he and the student benefit.